Because bees need water, too. Keeps bees away from hoses and water bowls. Bees don't just forage for nectar, they sometimes travel miles for water, both to drink and to keep their hives cool and humid. They look to perch and drink around small puddles, which often means fountains, wet laundry, hose faucets, birdbaths or your pet's water bowl. The Bee Oasis is a much better spot for them. 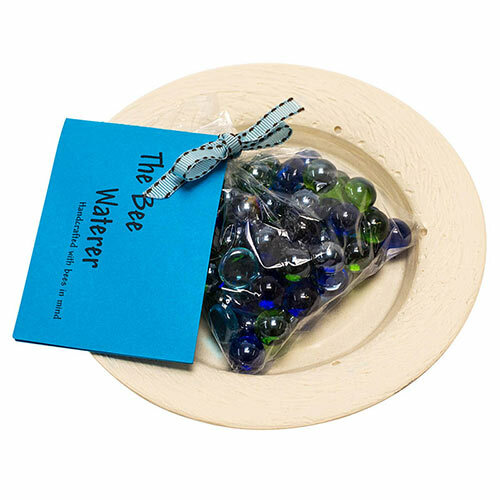 This weatherproof stoneware puddler is covered in a food-safe glaze and filled with glass stones. Bees don't like to get their feet wet and can easily drown in bigger puddles, so this allows them to drink safely and comfortably. 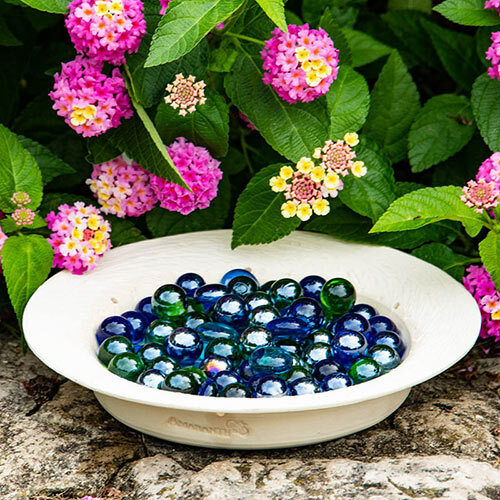 It's a charming garden addition, and small enough to put just about anywhere—keep it on a patio if you'd like to see these fascinating creatures at work, or set it up on a mossy rock amid your bee-friendly blooms. Bees will return to good water sources, so keep it reliably full and far away from your pet's water bowl to draw bees away and protect your Fido from a swollen snout. W7½"xD½"